Live Steaming News of IPL T20. Check out Schedule, Players and Team ranking, Live scores of Indian Premier League Cricket matches. A franchise cricket team, Chennai Super Kings is based in Chennai. Mahendra Singh Dhoni is the captain of Chennai Super Kings team and Stephen Fleming is coach of team. The Super Kings' home ground is M. A. Chidambaram Stadium. India Cements, one of the hot favorites of IPL 2011 is the franchise of Chennai Super Kings. Chennai Super Kings team has the ability to beat all other sides in this season of IPL 2011. In year 2008, they were qualified as runner-up, and in year 2009, they were reached at semi finals. Top four players of this team such as Captain MS Dhoni, Suresh Raina, M Vijay and Albie Morkel are retained by Chennai Super Kings for IPL 4. R Ashwin, Michael Hussey and injured Doug Bollinger are also retained by Chennai Super Kings. In IPL 4, Muralidharan and Laxmipathy Balaji are not involved in the Chennai Super Kings team. Chennai Super Kings has purchased players and made team strong. Players such as Hussey, Murali Vijay; Dwayne Bravo, Scott Styris and Albie Morkel, all are all-rounder. Dhoni and Raina will guide the team as well as Ashwin, Tim Southee, Kulasekara and Ben Hilfenhaus are other players. Chennai Super Kings is looking forward to build another record by winning matches. Motto of Chennai Super Kings: Fearless Entertainers who will play to win. 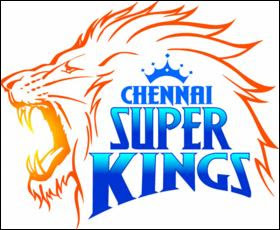 The logo of CSK is motivated by popular legends that indicate the lion is the king of the jungle. A sense of youth and vibrancy is offered by the illustration of the lion by using a minimalist style. Chennai Super Kings represent solid and sturdy performance orientation so it is complemented by the heavier lettering. The colors of team are yellow and blue; yellow represents the firey spirit that burns in the team's belly and blue stands for infinity. Owner - India Cements Ltd.
Hussey and Raina for great batting lineup.